The Meditub 3060WCA is Wheel Chair Accessible designed with a 21” contoured seat permitting the ability to slide in with ease. This roomy and palatial tub is assembled with an outward swinging door. 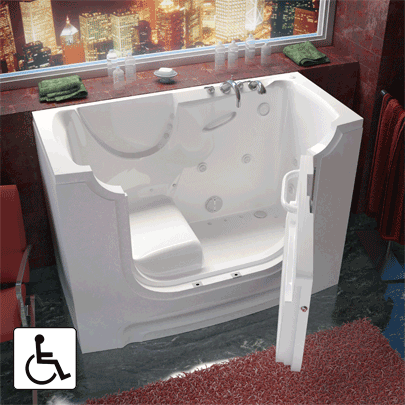 It provides the luxury of bathing and showering alone all while maintaining security and independence. The tub is constructed of the highest grade fiberglass and composites with a gel coat finish for beauty and durability. Included is a stainless steel frame for long lasting strength and adjustable for easy installation and leveling.